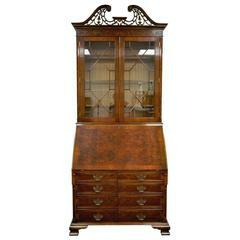 This yew secretary bookcase, also known as a bureau desk, is handmade in England as a Georgian period reproduction. Every aspect of this English-made secretary desk, from the techniques used to the materials themselves, is of the absolute highest quality. The yew, for instance, is treated to an elaborate finishing process that includes hand-distressing and waxing, while black line inlays as well as beautiful green leather desk inlays provide an elegant contrast with the yew. 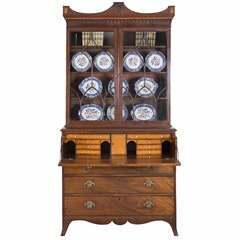 With three large exterior drawers (with handcut dovetails), two fully adjustable shelves, and a variety of desk compartments and drawers, this secretary also offers plenty of storage space. The bookcase and desk sections lock with an accompanying set of keys, while the secretary as a whole rests on sturdy shaped bracket feet. Enough cannot be said for the quality of construction that has gone into this secretary bookcase. Most importantly, the finish is a hand rubbed finish very much like a French polish. The drawers feature handcut dovetails and oak linings. The brass handles and locks are solid antique brass forged in England. While open, the desk measures: 45? wide x 18? deep x 30.5? tall. This piece separates into two parts (top and bottom) for easier moving. English secretary bookcase in mahogany, 18th century, made in 3 parts, original shaped feet, period heavy brass, great color and finish, impressive, traditional Chippendale design.